For the past few years, a new Galaxy Zoo project has been under development. This project allows the creation of models of galaxies inside the Zooniverse website (although in a slightly experimental fashion). Many of you helped trial this project in December of 2017, and some have classified since it was quietly launched in late April. I’d like to take this opportunity to share with you some of the early results we have obtained from your classifications! 260 of you helped beta test and debug the project in our beta, providing invaluable feedback (most of which we hope we addressed!) and submitting over one thousand test classifications of our small test sample. 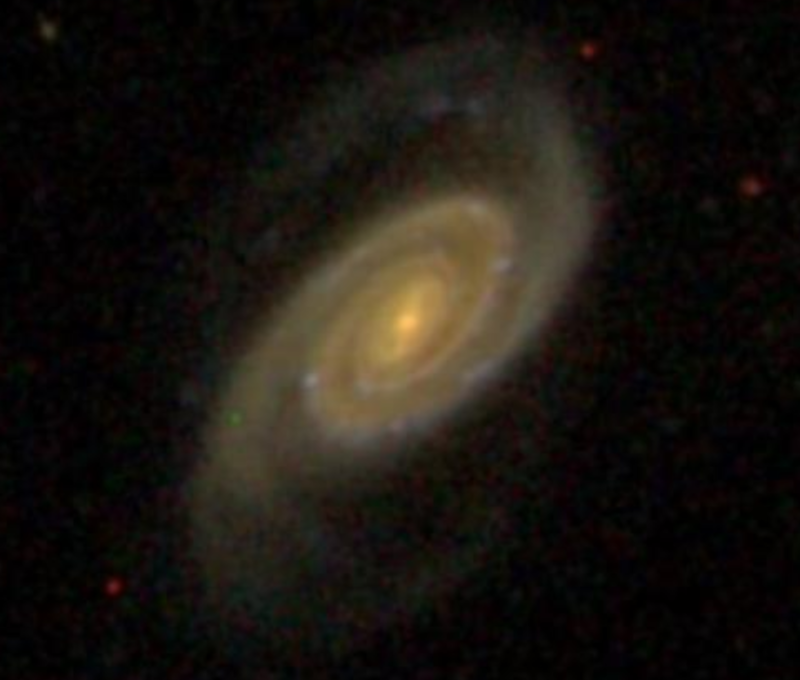 One of the images in this sample was the SDSS r-band image of the galaxy below, catchily known as SDSS J104238.12+235706.8. There are a number of classifications which have either crossed the center of the galaxy, linking the two arms with one line, or which attempt to enclose the spiral (as in the GZ:3D project) rather than tracing along the center line. This confusion arose from the short tutorial and confusing help text present in the beta, which was flagged by our testers (thank you!). We can make use of unsupervised machine learning techniques to cluster together these drawn arms, and extract points corresponding to each arm (while throwing away some lines which didn’t fit into our groups). 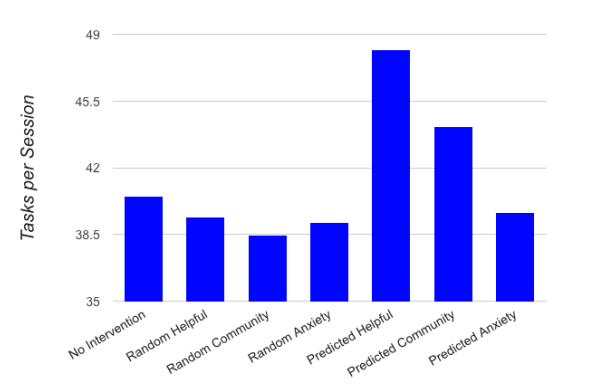 Taking one arm as an example, we identify points which could be considered outliers, and remove them to improve our later fit (using another unsupervised machine learning technique called Local Outlier Factor). 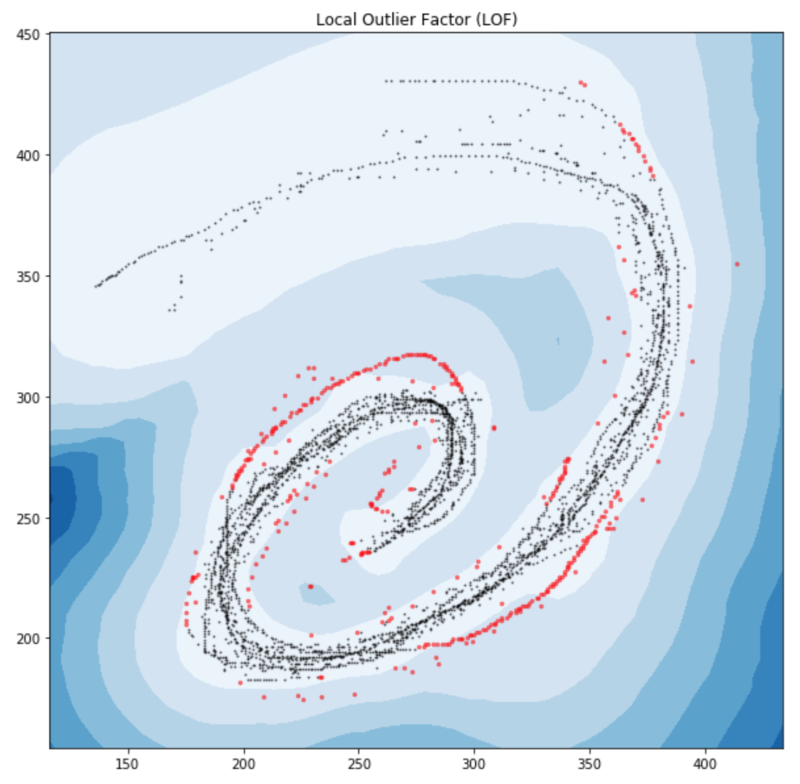 In the image below, red dots correspond to points identified as outliers, and the blue contours can be seen as a probability map, with points in regions of darker blue being more likely to be an outlier. 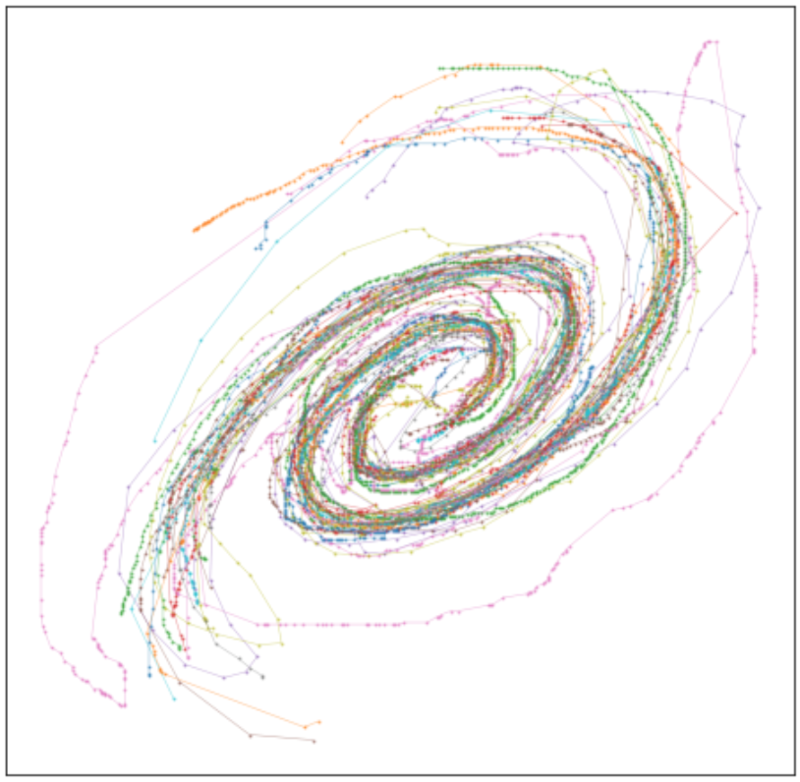 What we’ve discovered from the beta trial is that we need at least 20 attempts at drawing spirals on a galaxy to get reliable answers, so we’re keen to get more people trying to build galaxies on Galaxy Builder. 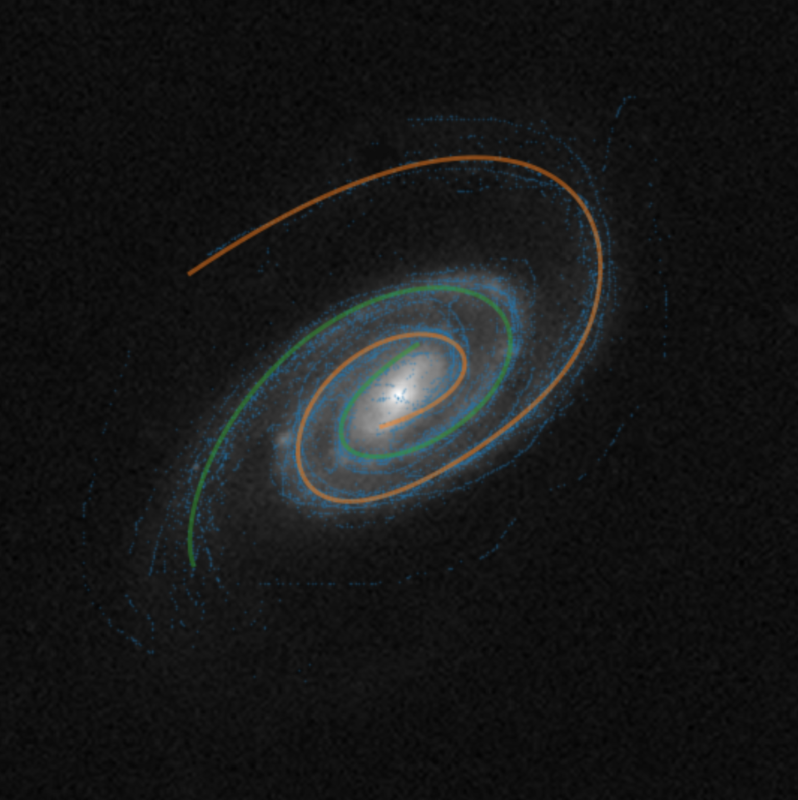 If you’d like to help please join us at https://www.zooniverse.org/projects/tingard/galaxy-builder. 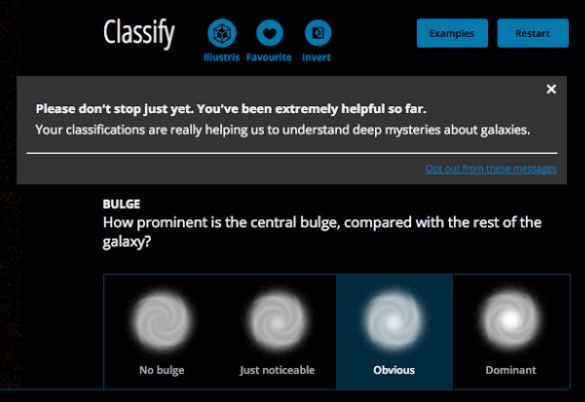 If that’s not your thing we still need classifications on Galaxy Zoo: 3D, and the classic Galaxy Zoo is still live with all new images from the DECaLS survey.